i just love your drawing style. you're extremely talented. xD it's so pretty! sakura's face is drawn really well, just like CLAMP style that i love so much! though i've strayed from that style onto my own, i really love this picture!!! Hey, it's really nicely done, but Syaoran's face is a bit elongated. 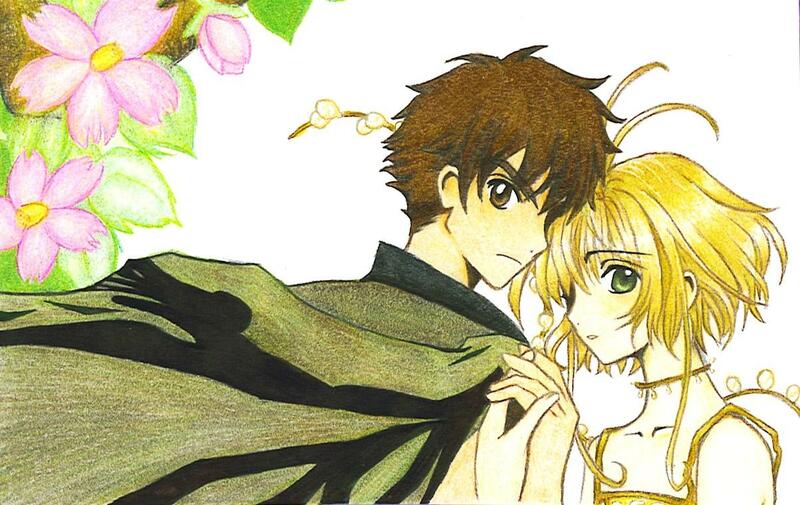 Your shading and coloring, etc is all very nice (I wish I could color like you did) and you've captured CLAMP's style nicely, and that's pretty though, especially since there was their side views in this pic. I'd work a bit on the hands, but other than that, It's really good!! thanks :) i think that syaroan's face got a little streched when i scanned it because looking at the actual picture, it's not the same...plus, i seem to have forgotten to resize when i scanned it. the original is about 3 1/2 x 7 inches, too.